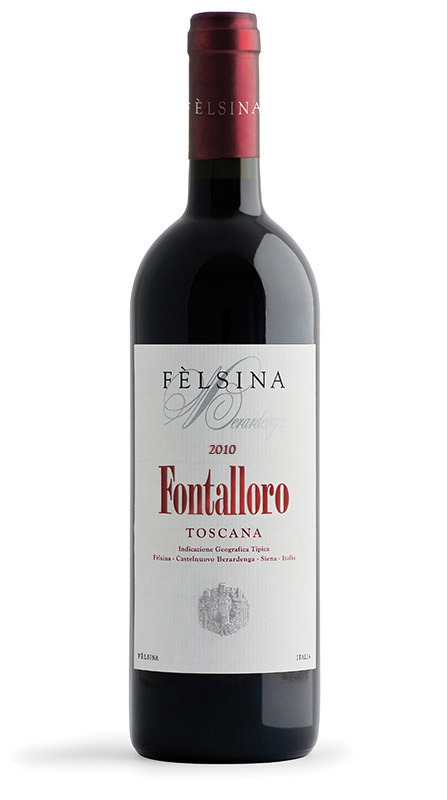 Fontalloro is the most representative expression of Fèlsina’s Sangiovese. Fontalloro grapes come from vineyards straddling the border between Chianti Classico and the Chianti Colli Senesi denomination. The vineyards lying within the Chianti Classico appellation are in the highest area of Fèlsina while those in the Chianti Colli Senesi are lower down (407-330 meters above sea level). With a southwestern exposure, the grapes are influenced by diverse soil compositions: on the Chianti Classico side the soil is stony and calcareous; on the Crete Senesi side the soil is sandy, loamy and silty with pebbles and marine sediments. First vintage 1983. Poggio al Sole and Arcidossino areas. About 5.400 vines per hectare. Hand harvested in two phases, selecting the finest grapes. From the selection of the vineyards of the eighties were conducted thorough investigations to identify the most suitable parent plants at drawing grafting and replanting took place in the early 2000s. After the quality-selected clusters are de-stemmed and pressed, the must is fermented and macerated in stainless steel for 16-20 days at 28°C and 30°C, with programmed punchdowns and daily pumpovers. In March-April, the new wine goes into new and into first used French oak barrels; after 18-22 months of maturation, the final blend is assembled, bottled, and ages in glass a minimum of 8-12 months.